The Grand Baazar is very high on most tourists’ itineraries, and with good reason. This enormous site is the largest still-existing covered market in the world, spanning an area of tens of thousands of square meters. While the layout of the Bazaar is relatively geometric (in comparison to, say, the famously labyrinthine medina of Fez), the size of the place and the profusion of goods for sale still make it easy to lose one’s bearings. 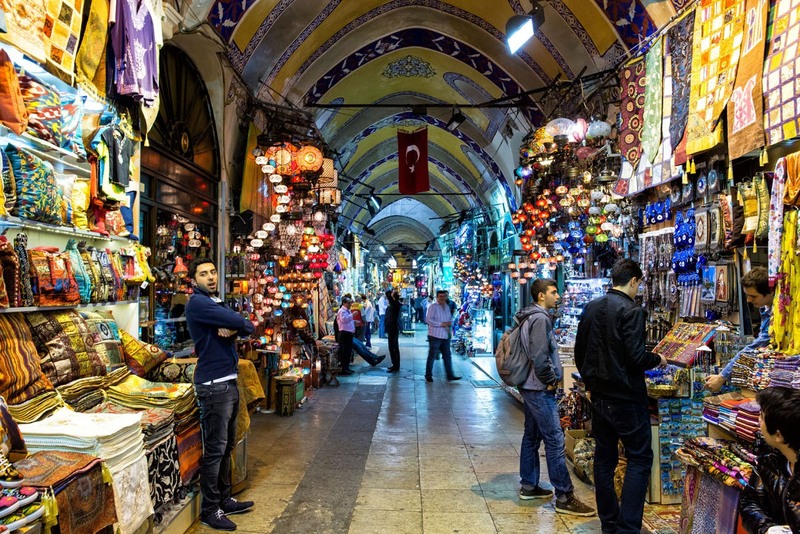 The Bazaar can boast a total of 64 streets and no fewer than 22 entrances, the most commonly used ones being the Beyazıt Kapısı and the Nuruosmaniye Kapısı. The original historical core of the Bazaar is the İç Bedesten, completed by Mehmet II (or Mehmet the Conqueror) in 1461. A bedesten (the word is a Persian borrowing) refers to an indoor arcade with shops; the İç Bedesten or Interior Bedestenhas thus become a building-within-a-building in the Grand Bazaar. This area, the oldest section of the entire Bazaar, is also known as the Cevahir Bedesteni or Jewel Bedesten, as jewels, gold, and other precious items were, and still are, sold within its well-guarded precincts. The second oldest part of the bazaar is the Sandal Bedesteni further to the Northeast, also called the Yeni (New) Bedesten since it was built later than the İç Bedesten. The name of the Sandal Bedesteni is a bit deceptive. It was originally a place to buy not boats (the meaning of sandal in present-day Turkish) but rather a type of luxury cloth known as sandal, made in Bursa – a center of textile production then as now. Though sandal can no longer be found there, the Sandal Bedesteni still continues to be a venue for buyers and sellers of rugs, carpets, and kilims, as well as other textiles.